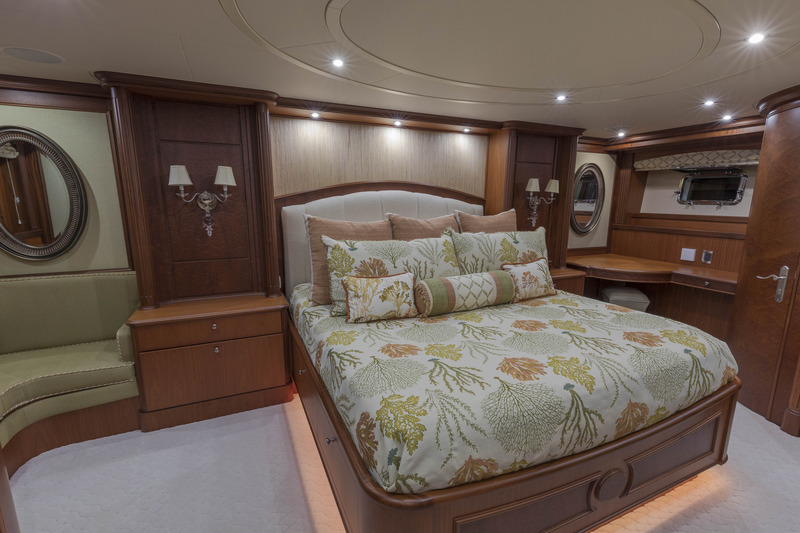 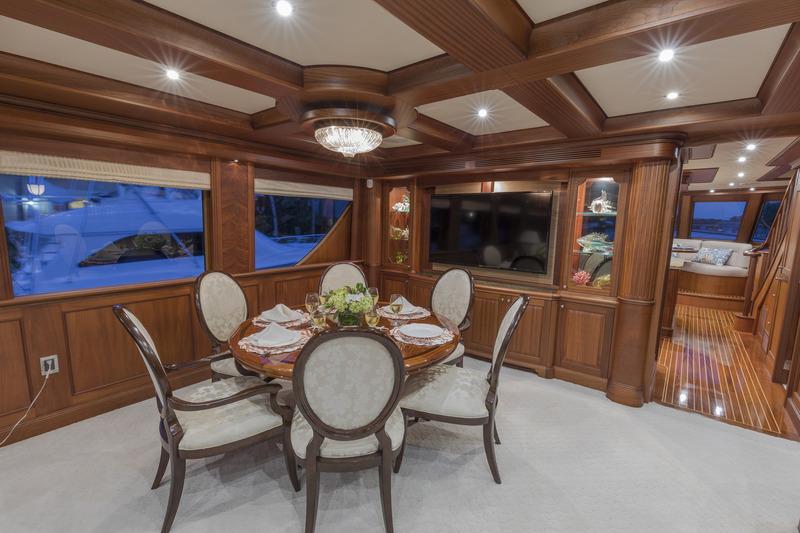 ANNDRIANNA’s custom statin Sapele interior was designed with incredible detail and craftsmanship. 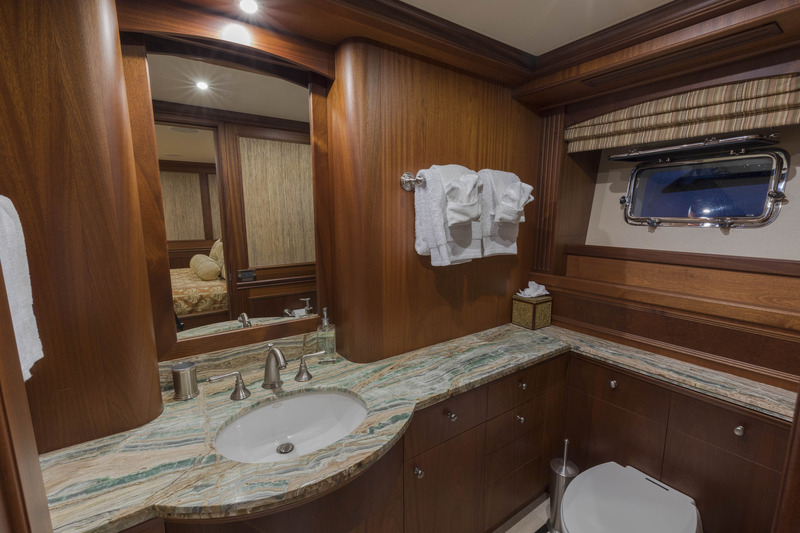 Her spacious and comfortable salon boasts numerous windows all around, allowing for plenty of light. 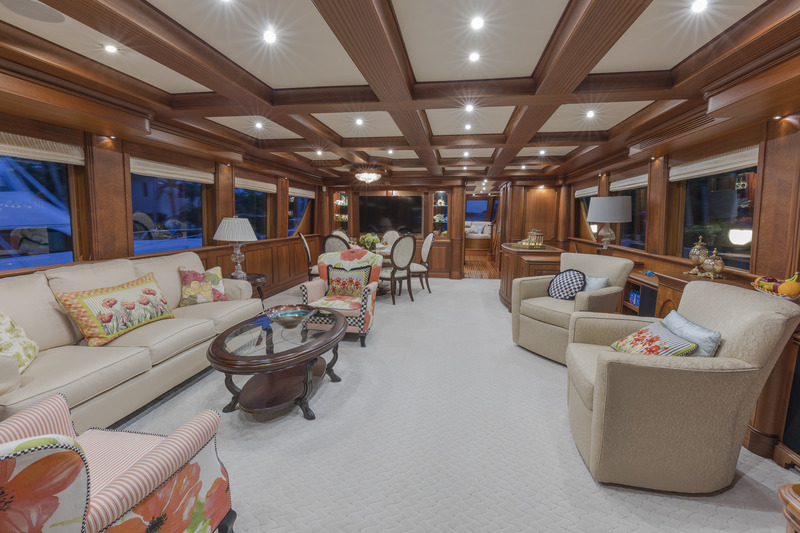 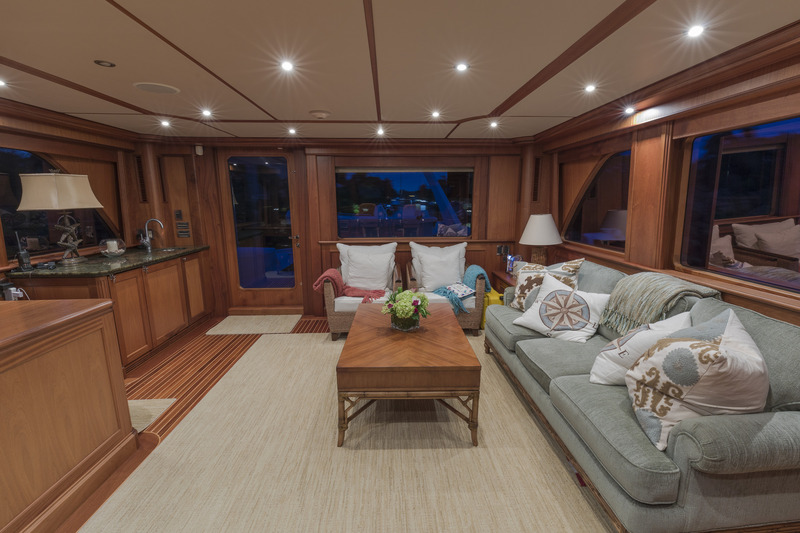 It comprises a custom sofa and coffee table to port with chairs to starboard, a central entertainment system, retractable SAT TV and dining cabinet. 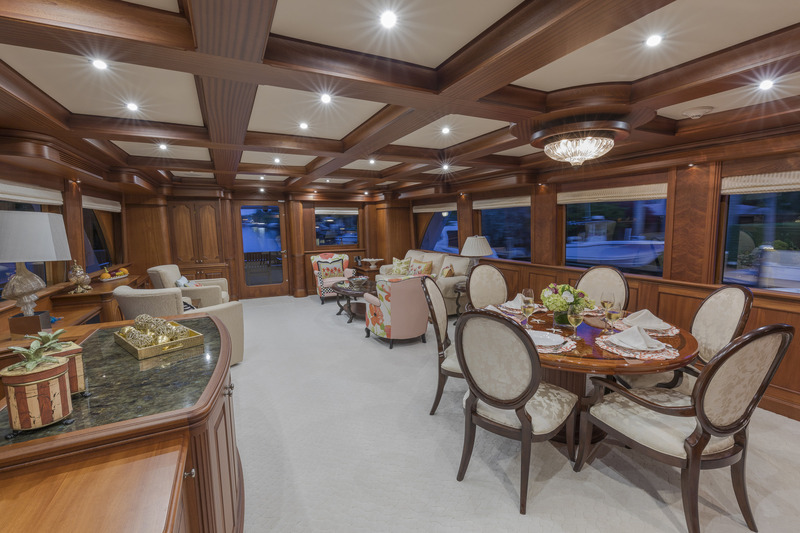 The contemporary open plan salon leads into the formal dining area, with a high gloss finished wooden table and chairs. 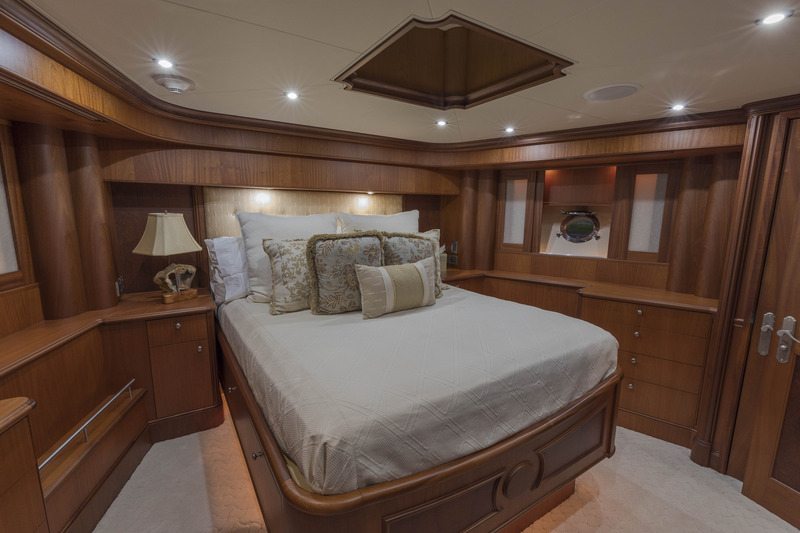 Opposite is private staircase on starboard, that leads down to the master suite. 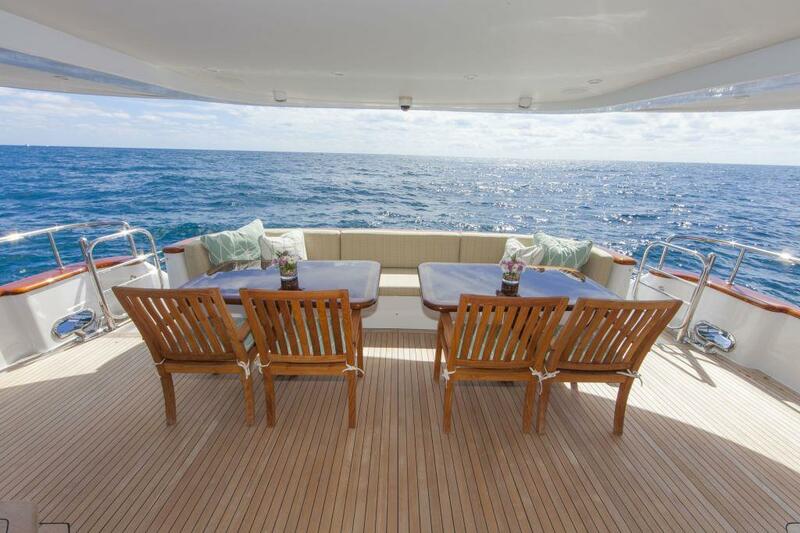 Further forward is the generous galley featuring astounding views forward. 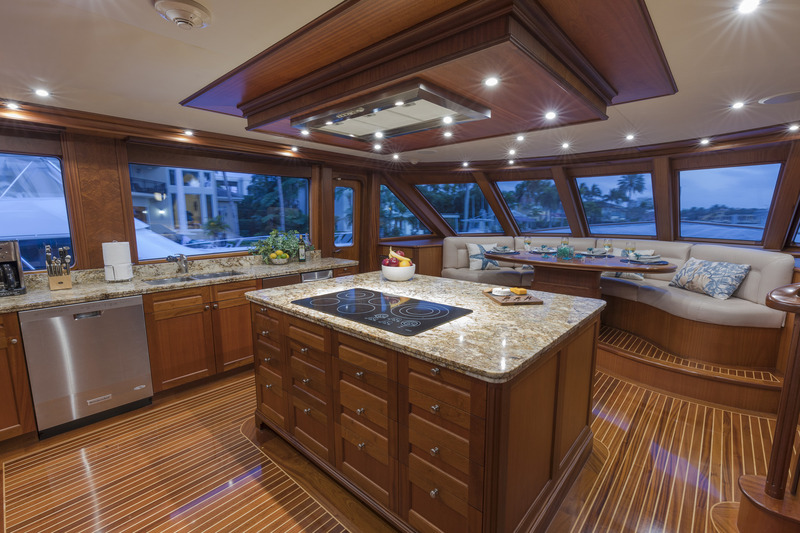 It features granite countertops and a functional island, as well as raised informal dining, with a custom wood table and comfortable seating facing aft. 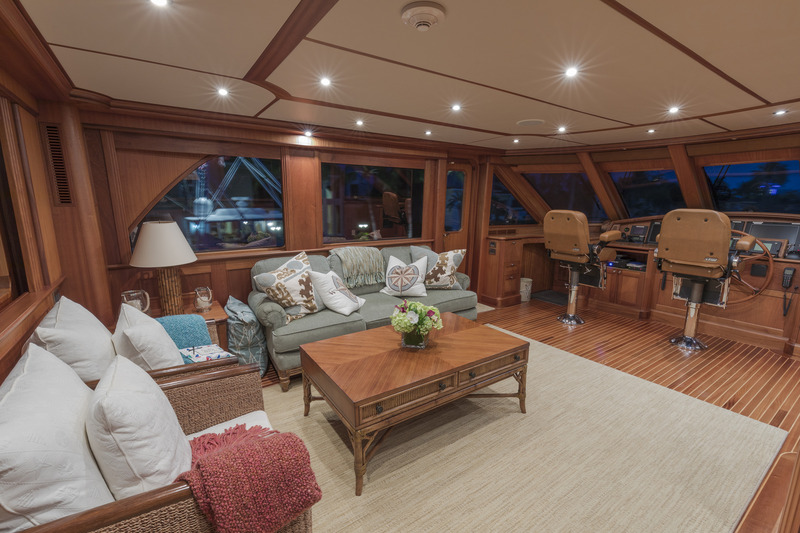 There is main deck day head as well as port and starboard doors to the exterior decks, a staircase up to the pilothouse and one down to the two guest staterooms. 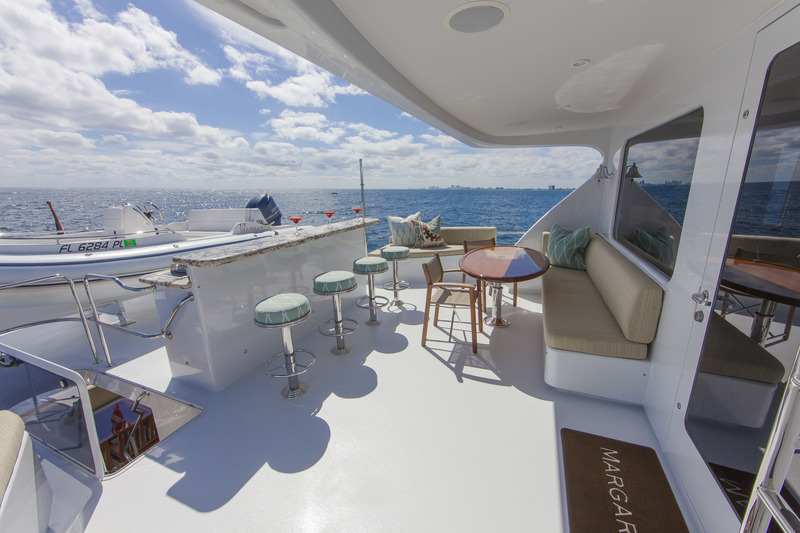 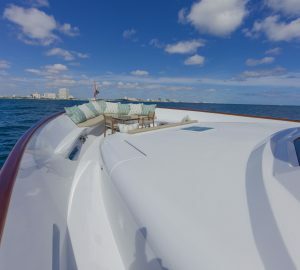 The yacht’s pilothouse is extremely comfortable, with lovely 360° views on the surroundings, offering a large sitting area, with a full sofa and two plush chairs, plus wet bar, ice maker and refrigerator. 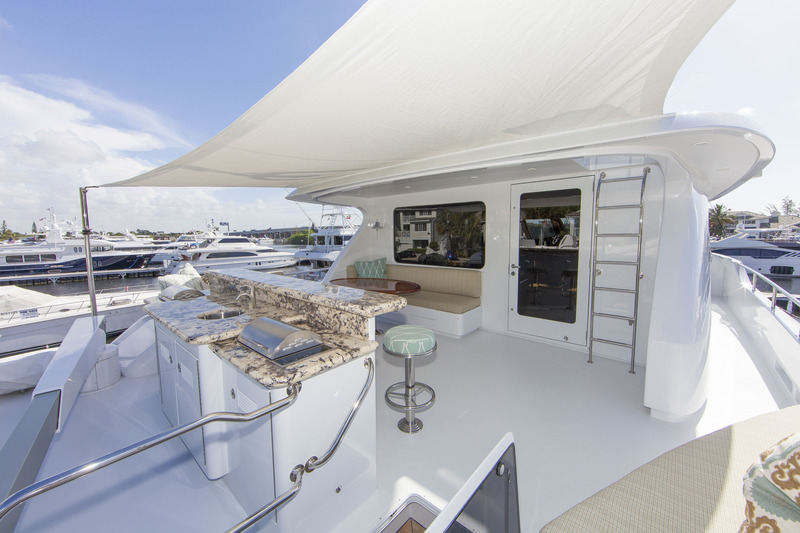 Port and starboard hinged wing doors provide access to the side decks as well as a door aft, leading to the Flybridge. 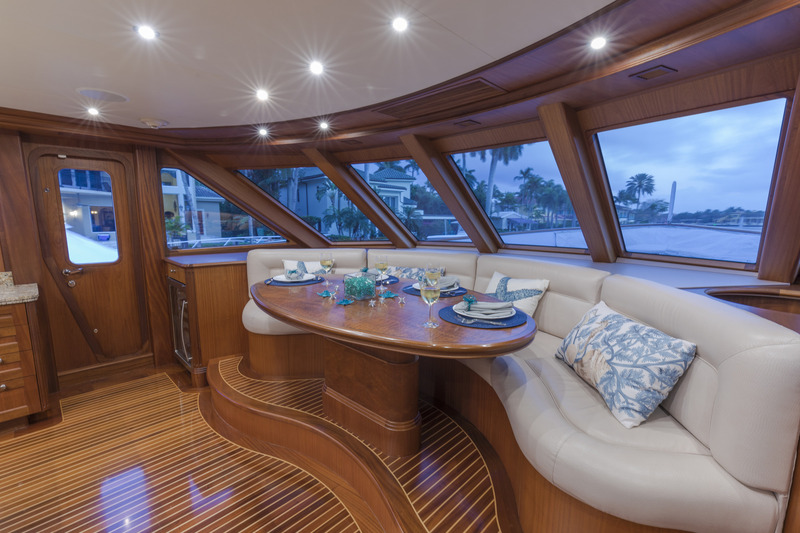 On the upper deck, aft of the pilothouse, the Flybridge comprises another alfresco dining option with comfortable seating and a wet bar, complete with a grill service station. 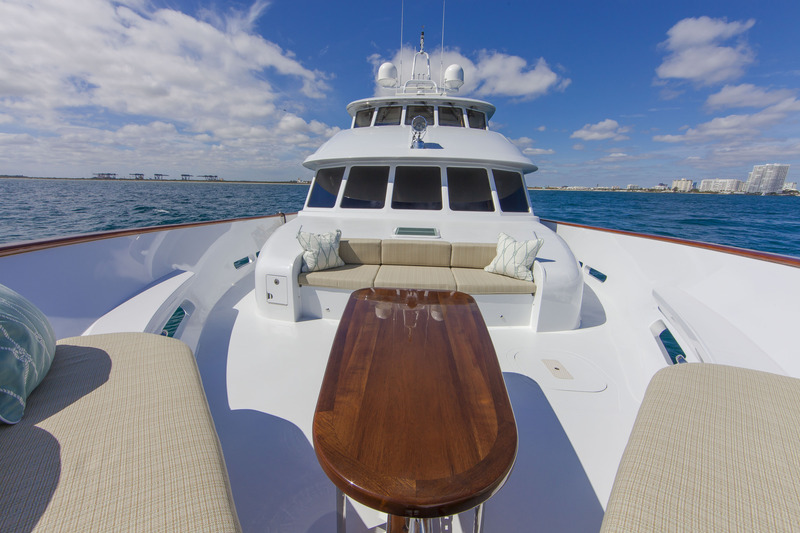 Storage, davit, tender, and life raft are also located here. 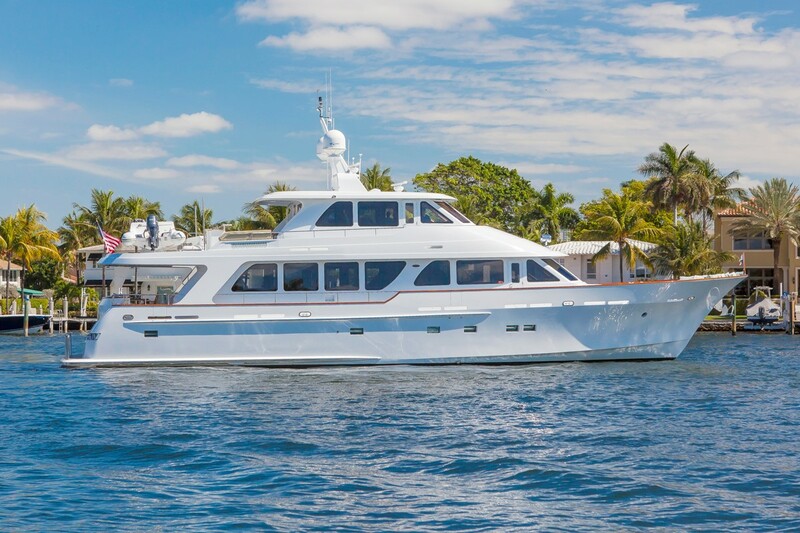 The swim platform on the lower deck has handy stainless steel hooped rails, allowing for effortless access to the great assortment of water toys this stunning yacht has to offer. 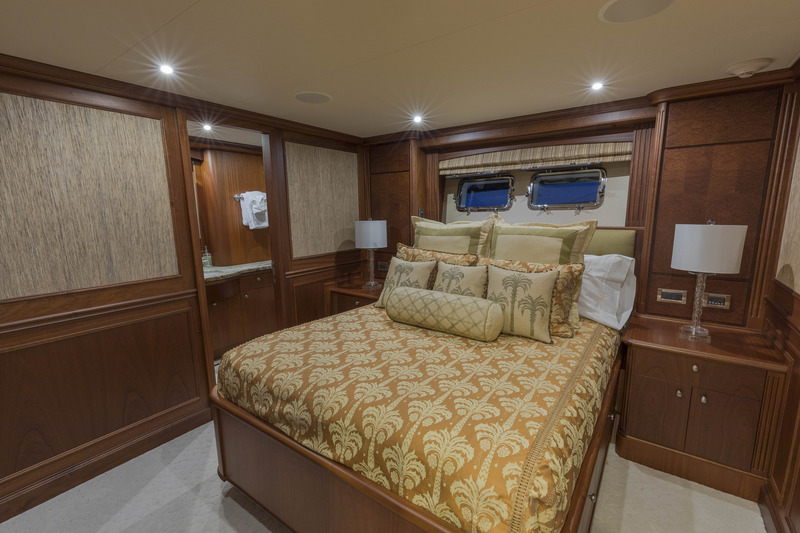 Accommodation is for six guests in three staterooms consisting of full beam master suite finished in sapele mahogany and earth tones, along with two VIP staterooms with queen sized beds. 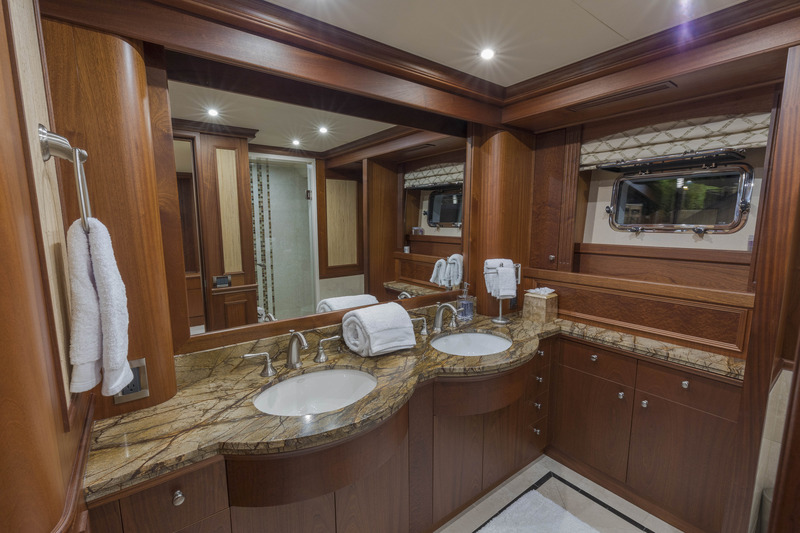 All staterooms have television screens and en suite bathroom facilities.